Finally, this bad boy is finished and I can stop using "square" in my entry titles. Eventually it's going in a frame, just like all the other things I make for myself. So, in about a year, it might be framed. I'm fairly happy with it. I do think it would've looked cooler on a gray fabric, but there's no way I'll stitch it again. Oh well. I've kind of changed plans for what my next project will be. 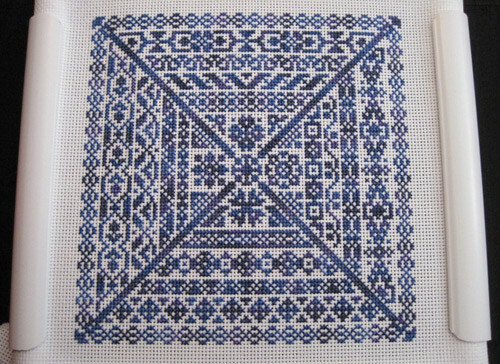 In the meantime, I'm going to stitch something pretty quick and simple. I was planning to start early today, but that didn't happen. So I've so no picture to show at the moment.